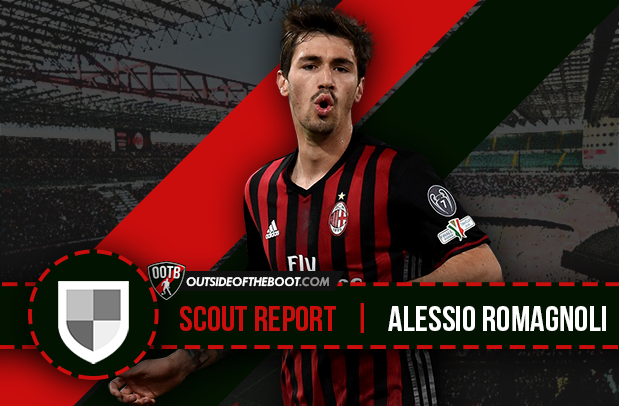 Miles Olusina writes a detailed scout report about Alessio Romagnoli, Milan’s next great no. 13. For a number of decades now, AC Milan have been one of Italy and Europe’s dominant forces, winning a myriad of titles domestically including 18 league titles and 7 Champions Leagues. With some of the world’s greatest players plying their trade in the red and black over the years such as Marco van Basten, Franco Baresi, Paolo Maldini and Andriy Shevchenko, the club is widely recognized as one of Europe’s elite. However, the last few years have seen a change in fortunes for the Rossoneri; the sale of key players Zlatan Ibrahimovic and Thiago Silva in 2012 catalyzed a descent into mid-table mediocrity and a consistent failure to qualify for the Champions League. Many began to wonder whether they would ever recover from such a fall from grace, however things appear to be on the up for Milan as an exciting new crop of young Italian players have emerged as Milan seek to reclaim former glories. One such young player in this new Milan side is 22-year-old centre back Alessio Romagnoli. Initially beginning his career at AS Roma where he made his debut as a 17-year-old, he made the switch to the San Siro in August 2015 for a fee of €25 million. He made his debut on the 18th of August 2015 and quickly made an impression. It was not long before he drew comparisons with the last great AC Milan centre back to wear the number 13 shirt, Alessandro Nesta. He has made his mark for the national team recently also, making his debut on the 6th of October 2016 in a World Cup qualifier against Spain. Born in Anzio, Italy on the 12th of January 1995, Romagnoli’s talent was evident from a young age as he joined the Roma academy at the age of 9 after being scouted by Roma legend Bruno Conti. He initially began his career as a central midfielder – which explains why he shows such adeptness in his technique – but was converted to a centre back later in his youth career. By age 17, he was handed his first team debut by then coach Zdenek Zeman, playing a full 90 minutes against Atalanta on 12th December 2012. He found opportunities limited in his first season, understandably considering his age but under new coach Rudi Garcia, began playing on a regular basis, showing his quality at left back and centre back. It was not until a loan spell at Sampdoria in the 2014-15 season, that his true quality was put on his display. He was easily Sampdoria’s best player that season, making 30 appearances as he helped them qualify for the Europa League. He earned himself a move to Milan in the 15-16 season, thoroughly impressing in his debut season for the Rossoneri in what was a disappointing season for his side. As with many great players, Romagnoli shows an adeptness in functioning in multiple roles as a centre back. With a passing accuracy of 87% and an average passing length of 20 yards, he demonstrates a better passing range than most centre backs and shows capabilities of operating as a ball-playing centre back. He can often be relied upon to circulate possession for his side in the build-up phase as a result of his willingness to receive the ball under pressure and his excellent technique. In addition, he shows his ability to function as a covering centre back when his side is out of possession, a role which he appears to be most comfortable with due to his superior reading of the game. Often when a dangerous pass is played in behind his side’s defensive line he opts to remain deeper and effectively sweep up any potential threat caused by vertical runs in behind, essentially operating as the last line of defence for his team. One area in particular in which he excels is his ball playing ability, more specifically his ability to receive the ball and help his side to circulate possession under pressure. Often times he is the outlet for his side in the buildup phase which is understandable as he is more technically proficient than the rest of his defensive counterparts in this Milan side. He can be relied upon to play out of pressure when the opposition has an overload and he has little time to make a decision in possession. Whereas a number of defenders may struggle when being faced with intense pressure from opposition strikers, he often bypasses the press with ease to avoid his side being counter-pressed in compromising situations. He showed this on countless occasions on his debut for the Italian senior side against Spain, a side well known for their high intensity pressing in the opponents build-up phase. In the image above he receives the ball in what could be considered a risky position, as defenders with less technical ability than him would find it incredibly difficult to play out of such a scenario. He is intelligent in this situation, in that he drops off very deep, virtually on the edge of his penalty area and opts to receive possession despite pressure from Spanish forwards. Occupying such a deep position not only allows him more time and space to receive the ball but it invites pressure from the Spain forward which disrupts the compactness of the press and gives his teammates further forward the opportunity to receive the ball behind Spain’s initial wave of pressure. Now as a result of the Spain player being provoked with the ball, the Italian player receiving the ball on the next line of play can now do so with a large amount of space. He again shows his technical prowess in this scenario as he faces a challenge from the onrushing Diego Costa. Instead of panicking and simply laying the ball off to one of his teammates hesitating when receiving the ball, he shows great composure in flicking the ball past the Spain forward which again creates space for the player receiving the ball from him as the pressure has been bypassed. In both of these scenarios he has shown that he is capable of inviting pressure from strikers to create space between the lines for teammates further forward, something that points to a tactical intelligence that is not very common in players his age. He excels also in his reading of the game; his anticipation and his ability to cover space are both key facets of his game. As mentioned before he demonstrates adeptness in playing the cover role as a centre back ensuring that dangerous vertical passes played in behind his side’s defence are dealt with by occasionally dropping deeper than the rest of his defence. In addition, he covers his full back well, giving him license to occupy much more advanced positions on the field and combine with the winger on his flank, safe in the knowledge that Romagnoli will be on hand to ensure the LB-CB channel is not exposed in defensive transition. Here Milan are in defensive transition, as the ball is played into the LB-CB channel into the Torino winger. Typically he is quick to sense the danger and moves out wide to intercept the pass before the opposition player can receive possession and possibly be one-on-one with Donnarumma in goal. Had he chosen to remain in his initial position and pressed the ball when the opposition player received it instead of before, he would have been able to gain momentum and run at Romagnoli which could have led to a dangerous chance being fashioned in the box. It is because of this positional intelligence that he does not attempt a high number of tackles per game, achieving a total of only 18 at this point in the campaign which pales in comparison to many of his defensive rivals in Serie A. To many this may appear to be a weakness, however to some it is a sign of great awareness and positioning on the pitch; an opinion shared by former Milan great Paolo Maldini who famously said ‘If I have to make a tackle then I have already made a mistake’. Romagnoli instead ranks high in interceptions, making a total of 37 so far in Serie A this season. Despite showing an excellent composure in the centre of defence when in possession of the ball, he does tend to display an erratic side when on the ball in attacking transitions. When regaining possession for his side he often faces pressure from opposition players looking to counter press, pressure which he fails to deal with on occasion considering his composure on the ball. It leads to him clearing the ball and his side losing possession, putting an end to a possibly promising attack. He has completed 150 clearances this season, an insane number for a player with such good ball playing ability. That said, it may not necessarily be a result of indecision or poor technique but rather a lack of options on the ball due to poor structure and spacing from the Milan side as a whole. He exhibits this in a game against Juventus when his side regain possession. An aerial ball falls to him and with Higuain right behind him putting pressure on the ball, he resorts to clearing his lines. A alternative solution may have been to control the ball and open out to play to left back De Sciglio who has a huge amount of time and space. However, as a result of his body position and failure to be aware of surroundings in that moment, he chooses to clear the ball and Milan give possession back to Juve.